Part I of a series on the home of the White Sox for 81 seasons and over 6,000 games. Before they graced the playing surface at 35th and Shields—heck, before they were even the Sox—the Chicago White Stockings, a charter franchise of the upstart American League, played their home games at South Side Park at 39th and Wentworth. In 1900, the grounds (previously used by the Chicago Cricket Club) were purchased by the Sox original owner Charles A. Comiskey, or “The Old Roman” as he was known because of his stately appearance, authoritarian manner, and a fondness for sandals and loose flowing garments. Comiskey purchased 15 acres in the Armour Square community, between 34th and 35th and Wentworth and Shields. The site was then being used by an Italian vegetable peddler and before that was a city dump and cabbage patch (I can’t help but associate this information with the only non-baseball trading cards that I ever loved as a pre-adolescent). Architect Zachary Taylor Davis, with Armour Institute credentials, was commissioned to draw up plans. Comiskey wanted a pitchers park to play to the team’s strength (in general, home runs were silly back then), so he sent staff ace Ed Walsh with an architect on a ballpark tour for design ideas. Walsh didn’t disappoint. The park plans called for a capacious outfield, 362 feet down each line and 420 feet to straight away center. Because of the vast lot upon which Comiskey had to build, White Sox Park (it would be renamed Comiskey Park a few years later) was to be the first symmetrical ballpark in the majors. 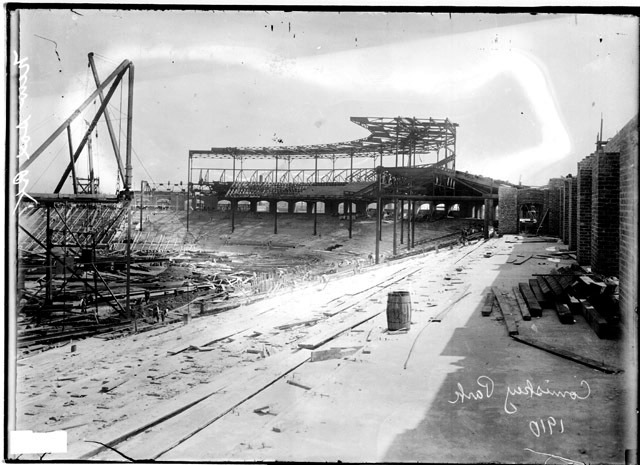 On Jan 30, 1910 Comiskey announced the beginning of construction, and the expected completion date of July 1 that same year. The land cost $100,000, construction costs thought to be $350,000, plus more than a hundred-grand for grading, furniture, fixings, etc. and the estimated total cost of the new park was $500,000. All costs were to be covered by ownership. Oh my, how times have changed. Comiskey spent well over that figure. A steel strike beginning in February in Bethlehem, PA (where petulant workers were demanding Sundays off and 12 ½ cents an hour - the nerve!) delayed progress on the park. Comiskey dug deep into his pockets, called in some favors, and somehow had the park ready to go on schedule. It was said that on opening day workmen were exiting as spectators were entering the new park. But open it did, and with much fanfare. A parade of newfangled contraptions called “automobiles” carried dignitaries to Sox Park. Drivers “clasped hands” as they made their way to their destination, presumably out of boredom. Car radios wouldn’t become common for another twenty years. There were flags unfurled, banners presented, floral displays admired, and rousing brass band melodies everywhere, because that’s how they did it up back then. Indeed, Sox Park was impressive by the standards of the day. Its original 29,000 seat capacity was a baseball record. Wooden grandstands were increasingly a fire concern (the stands at South Side Park went up in flames in 1909), so Comiskey built his park out of steel and concrete, including double decker grandstands along each baseline. Box seats for the city’s well-to-do, including "city, county, and baseball notables," could be had for $1 or more. Grandstand tickets cost 75¢. Pavilion seats further down the line 50¢, and any one of the 7000 bleacher seats set one back 25¢. Davis designed the new park to be in harmony with its surroundings. The red brick archways mimicked the aesthetic of nearby factories and churches. The park had such an industrial feel that contemporary writers commonly referred to it as a baseball “plant,” as in: "the greatest ball plant in the world.” Actually, it’s much more likely that “ball plant” was just some typically nutty early-twentieth-century speak. Sox Park was located just east of the Illinois Central Railroad tracks, in a shipping and manufacturing district that included Chicago Shipping and Storage Company, C.P. Kimball and Company Automobile Factory, and People's Gas. To the east was the Wentworth street car line, which carried downtown businessmen (they were almost all men) to and from the game. The residents of the Armour Square district were mostly working-class, living in cottages, two-flats, and apartments. Sox Park not only altered the scale of professional baseball in Chicago, but the culture of spectating as well. How we, as fans, experience games has a history, within which this was an important moment. At South Side Park, fans were more than witnesses to events on the field; they were part of the action. Grandstands were built near the field of play, and without fences or walls or dugouts, spectators were in close proximity to players. Shouting matches and even fights between fans and umpires or opposing players were common. Sox Park was not a bandbox but a destination of some pomp, and within its confines a certain amount of decorum was expected. Like a city museum or green space, the new ballpark “became a source of civic pride and sociability,” explains South Side historian Robin Bachin. Charles Comiskey, a “mass-culture entrepreneur,” was among the first to link explicitly sports enterprise with wider social good. Through his ballpark, Comiskey was more than a successful businessman; he became a civic leader. The new ballpark had its social merits. But what Comiskey and other city notables may have called cultural uplift I’m more apt to describe as democratic initiative. While crowds tended to be segregated by social class (wage-earners in the 25¢ bleachers, middle- and upper-class folks in the pavilion and grandstands), the spectacle of baseball at Sox Park brought diverse people (though at this time, mostly white men) from around the city who joined together in rooting for the “home team.” Watching baseball helped Irish- and German-Americans transcend ethnic differences and "Americanized" newer Eastern European immigrants. The uniforms were designed by G. Harris White, certified dentist and White Sox pitcher. Watching White work hitters wasn't exactly like pulling teeth for Sox fans. In 1910, he was 15-13 with a 2.66 ERA and 1.137 WHIP in 236.2 IP. White averaged 4.2 K/9 making him a veritable strike out artist in that era. The Sox were pitted against the St. Louis Browns on Friday at the new park, and the battery consisted of Walsh and Billy Sullivan, in his first game back after a long layoff due to a bout of blood poisoning that almost killed him. Unfortunately from the get-go “the game was the enemy’s all the way.” The decisive “round” proved to be the third: “there disaster overtook us.” Truesdale singled. Killifer fouled out but Truesdale stole second (Sully’s throw was a bit short). Pelty advanced the runner to third with a ground out. Then Truesdale scored on a single by some thug named Stone, who soon after attempted to steal second. Stone broke for second and Sullivan’s throw beat him, but as Sox second-baseman Rollie Zeider put the tag down, Stone used his spikes to gouge Zeider’s hand, who understandably dropped the ball. Zeider was injured so badly he had to leave the game. The Browns scored again in the inning. Alas, without Zeider’s .548 OPS in the leadoff spot the 2-0 deficit proved too much for the White Sox to overcome, and they lost by that tally. So began over eight decades of baseball at Comiskey Park at 35th and Shields . . .